After work on Thursday I made my way through traffic to the 103 and got on the highway for a drive into Marriott’s Cove, on the south shore. I was meeting my family there for a birthday dinner in honour of my sister’s 30th (which she was of course, thrilled about). View from our window. Pardon the glare. 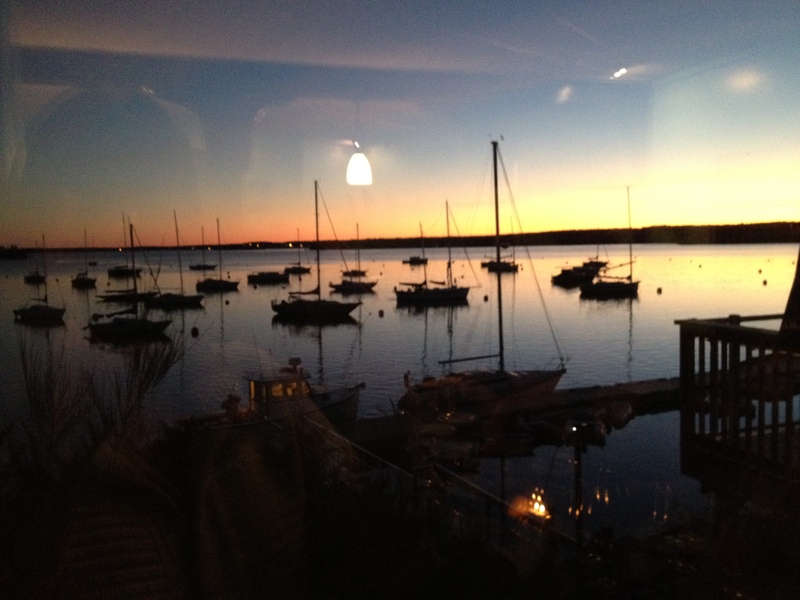 I was headed to The Galley restaurant, located at the very picturesque south shore marina. Curious to see why The Galley is rated as the number one restaurant in the Chester area on TripAdvisor, I had checked out the menu online in advance. It all sounded typical: seafood, pasta, pizza, various burgers and sandwiches. By no means fine dining, or even casual fine dining, but there was a certain flare added to these “same old” menu items. 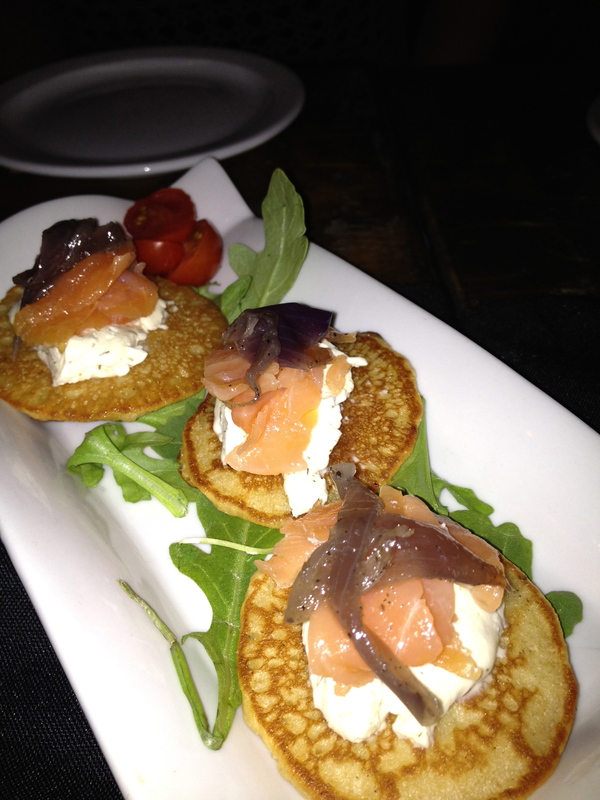 We started with a couple appetizers: smoked salmon pancakes with dill cream cheese and caramelized onion (as pictured above), brie “fritters” (which were simply breaded and deep-fried rectangular pieces of brie), and chicken wings – which I didn’t photograph. These were all tasty. I chose the lobster and brie grill for my main and substituted a caesar salad instead of the regular house-made kettle chips. 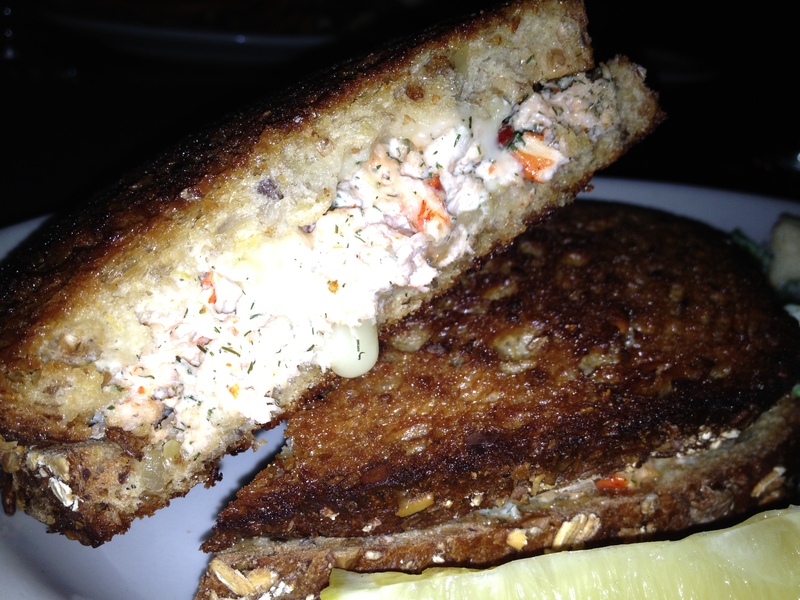 This is essentially a grilled cheese sandwich, with lobster meat; the multigrain bread they used was unbelievably crunchy-crispy. I really enjoyed the sandwich, although I found the ingredients not overly complimentary of one another. It’s not that they didn’t taste good together, it’s just that the lobster distracts you from the brie, and the brie distracts you from the lobster. A really good lobster roll, or a really good grilled cheese would be better than this combination of the two. I may have to agree with the grilled cheese purists out there: you don’t really need to add “fancy” ingredients to a grilled cheese to make it better. Although it is fun to experiment. The interior would have you believe that it’s an upscale restaurant, and I would definitely label the food as upscale pub fare. 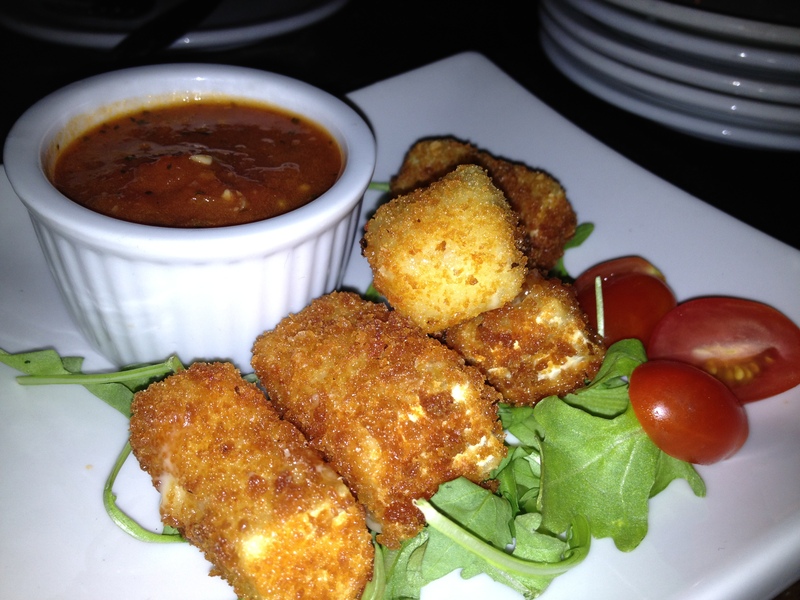 Maybe even similar to something you’d find at a gastropub. The view and the decor could lend itself to a fine dining menu, though, if the owners wanted to head in that direction. Service was friendly and quick. I would definitely go back if I was in the area and looking for a bite to eat. Next summer I’d love to drive there via the old 3 highway, eat on the patio, sip wine, and take in the peaceful, quintessential Nova Scotia view. Happy fall harvest! 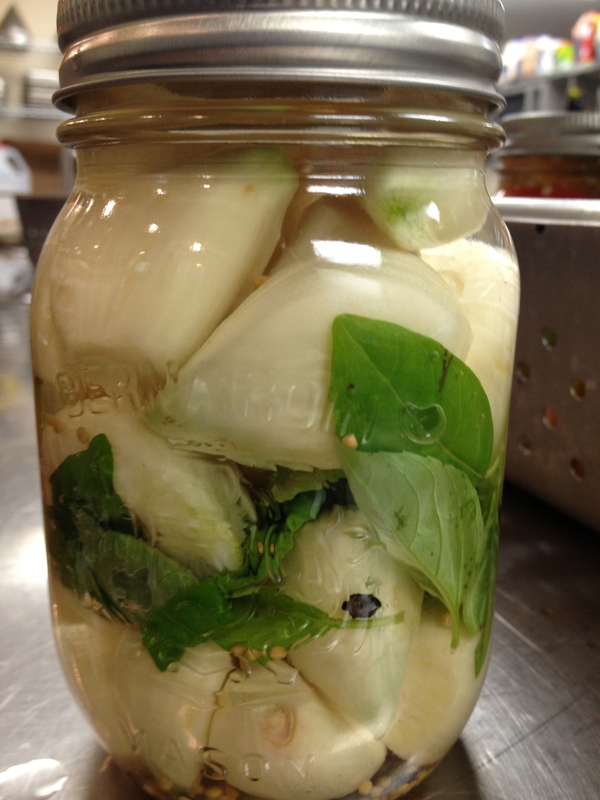 Last night we did something that we’ve been wanting to do for well over a year – host a pickling party. It does help that we had access to a commercial kitchen – but that small detail aside, we bought a bunch of awesome local produce (thank you, Four Seasons Farms in Maitland, NS) and created jar after jar of delicious, pickled foods. The process was pretty simple, check out the photo gallery below for a play-by-play. 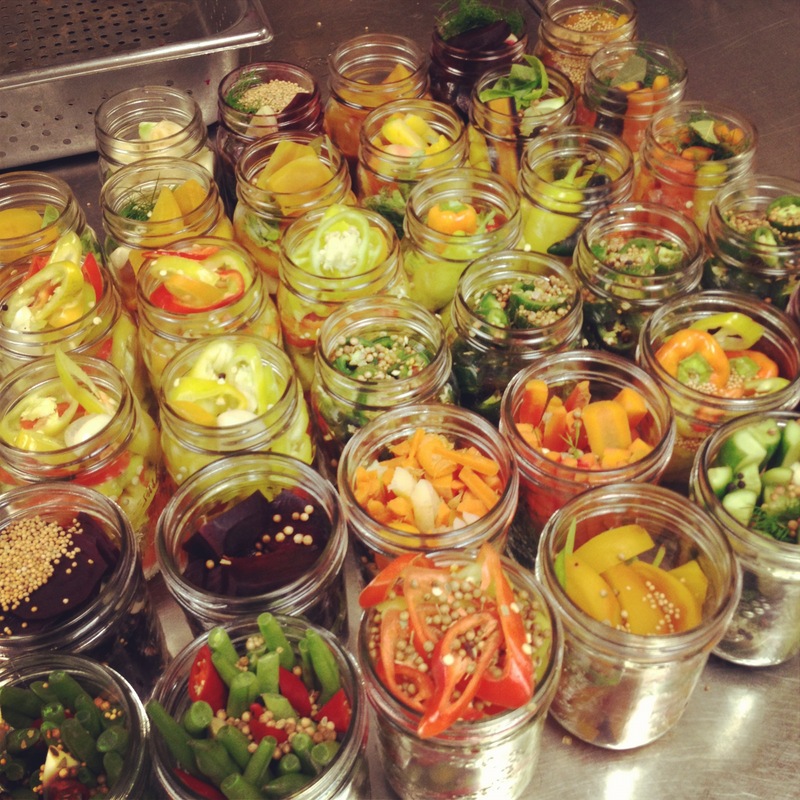 All you really need are mason jars (sanitize them), vinegars, salt, sugar, pickling spice and any combination of vegetables/herbs/items that you want to include. The common kitchen equipment you have at home will do the trick. Here are my top three pickled foods that I’m excited to crack open; only six weeks to go until they’re ready! 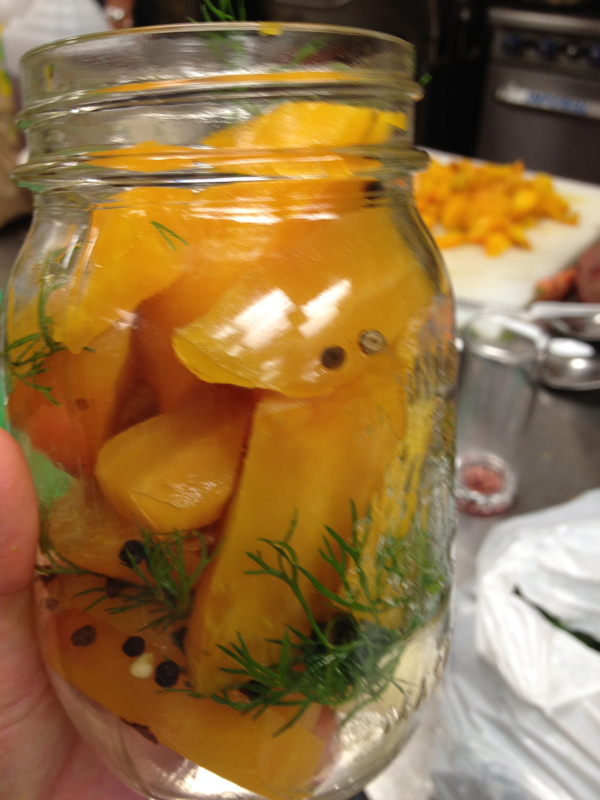 Pickled sliced golden beets with peppercorns, garlic, dill and basil. 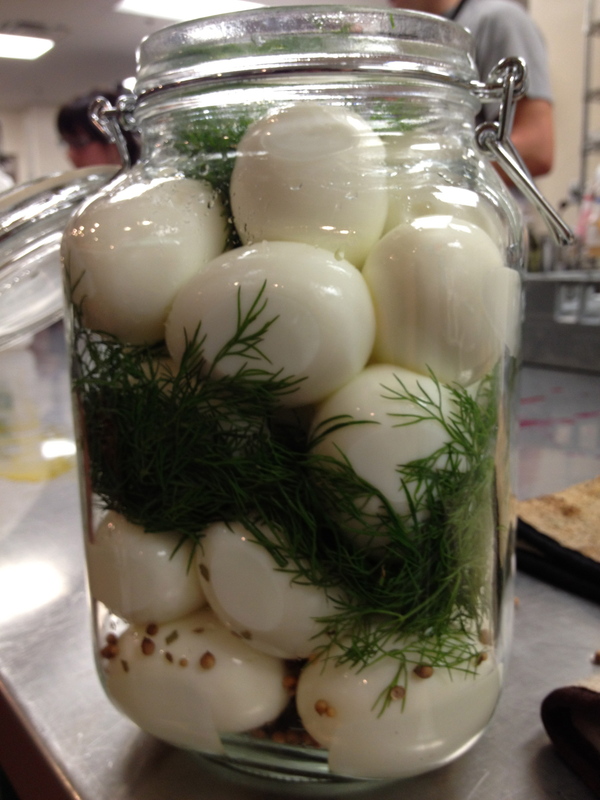 Pickled garlic with black peppercorns and basil.